Arkansas is known as ‘The Natural State’ for good reason. Much of its land area is relatively untouched and is particularly noted for its fascinating geology which includes caverns, sinkholes, towers, and grottos near many of its waterfalls. Ironically, Arkansas is also home to one of the world’s largest corporations: Wal-Mart. With some of the most beautiful and accessible national parks in the country, the state is a regional hot-spot for cavers, nature-lovers and waterfall aficionados. 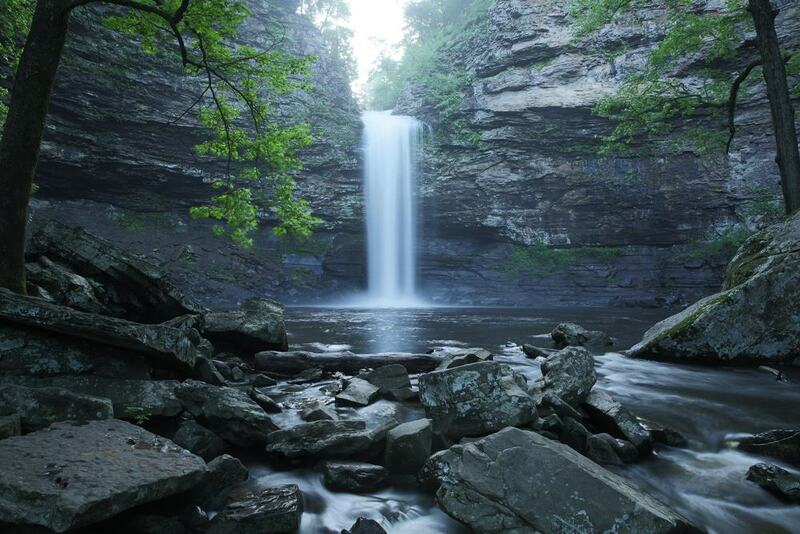 Below are 15 of the most amazing waterfalls in Arkansas. With no tiers or cascades to halt their drop, Hemmed-in-Hollow Falls, at nearly 210 feet tall, are among the most majestic in the entire state. Located in the Buffalo National River area which is part of the U. S. National Park System, they’re the tallest falls east of the Rockies according to some. The falls are best viewed in the spring, when the river is swollen with snowmelt from higher elevations. The falls are accessible by more than one trail, and by canoe or kayak too, depending on the season and water level. The park is located in Arkansas’ north-central portion, roughly between the towns of Jasper and Marshall. At just slightly less than 100 feet, these monster falls are located in the 3,500-acre Petit Jean State Park in Conway County Arkansas. The cascading falls have carved a deep trench into the stratified rock around them over the centuries, and are known as a place where rainbows seem to appear as if by magic. The falls are accessible via the Cedar Falls Trail, which is slightly more than 2 miles long and not very difficult. The area has a fascinating history, and the park is chock full of facilities, activities and amenities for every kind of traveler. 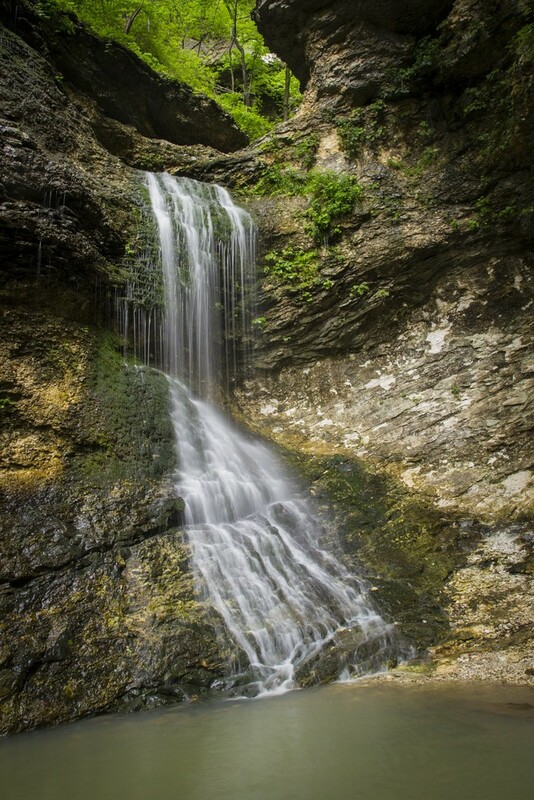 At nearly 75 feet, High Bank Twin Falls are impressive and tranquil falls located in the Boston Mountain area of the Ozark National Forest. Like many falls, they’re best observed after a rain, when the water flow is at its most impressive. Even when the flow is minimal, however, the falls are amazing and peaceful. Divided into two distinct streams, the falls cascade over worn, layered rock, before landing among the boulders and pool below. Though you’ll need to hoof it a bit to see them, the walk from the parking turnout is less than half a mile of easy trail, so get out and stretch those legs. Though the verdict is still out on whether these falls were named after the North American mountain lions that are native to the area, or rocker John ‘Cougar’ Mellencamp, when you see the falls you won’t care. 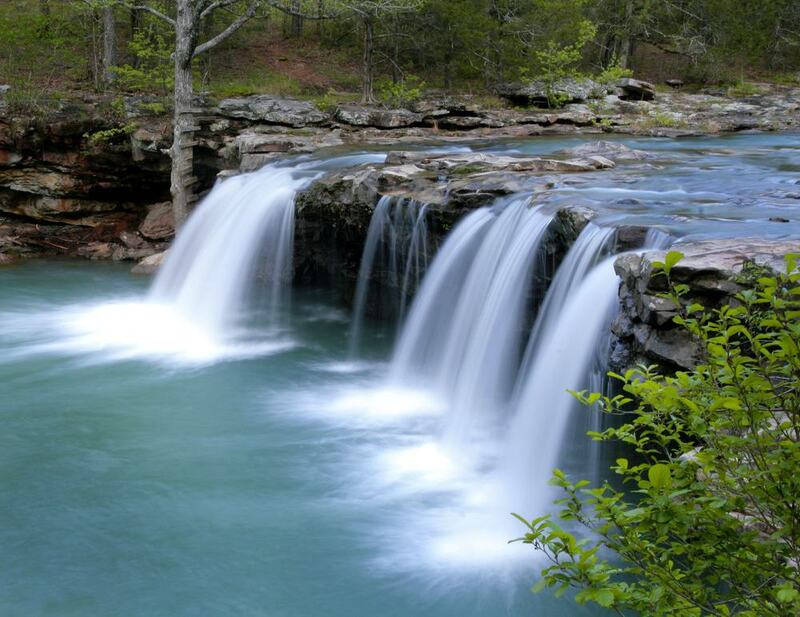 Also located in the Ozarks National Forest, the 80-foot Cougar Falls are one of 4 falls that can be found in the area, making them an imperative stop on a day full of magnificent waterfalls. The road which runs close to the falls has ample turnouts, and from there it’s a little over a mile of moderately difficult trail. At just shy of 120 feet, Kings Bluffs Falls are another of the tallest waterfalls in the state. 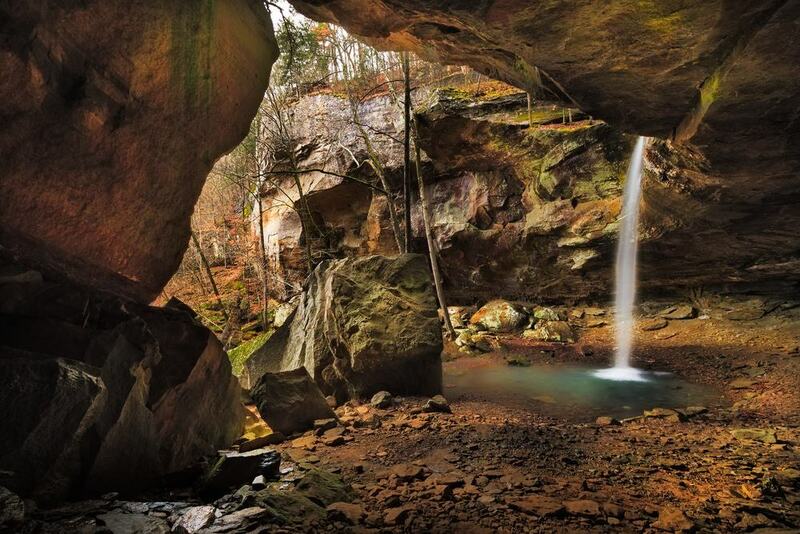 The falls are located in a part of the Ozark National Forest that’s home to an amazing array of cool rock formations, grottos, peaks and caverns. Once inside the park, the falls are accessible by the Kings Bluff Loop Trail which will take you to the top of the falls. The trail and surrounding rocks can be slick, so take your time, watch your step, and enjoy your scenery. If you’re at all like me, you’re probably asking yourself who’s Pam, and why does she have a grotto in Arkansas? Though these questions may never be answered, what’s important is that the cascade-style falls are nearly 40 feet tall, surrounded by pristine forest, and sport a cool cavern or grotto behind the falling water. 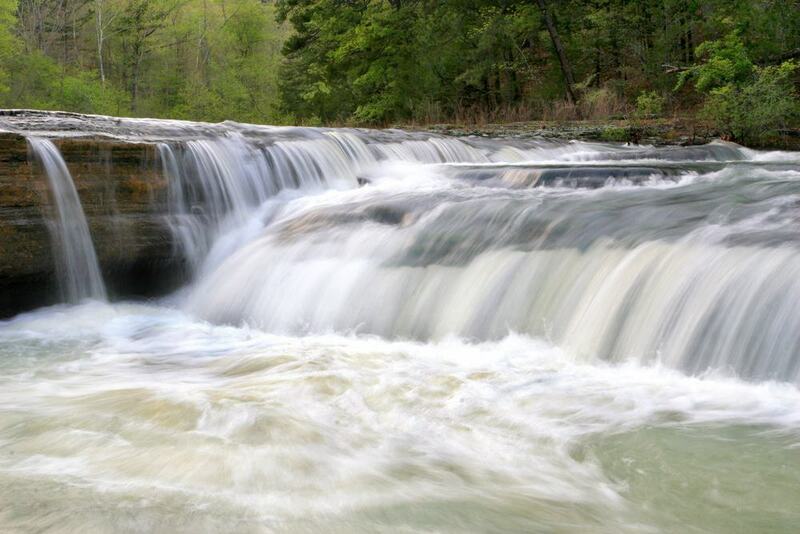 The falls are in the Haw Creek Falls Recreation Area near the towns of Russellville and Clarksville. You can get to the falls from the parking area and the campground. Although the trail is easy to follow, it’s got some tricky areas so wear decent shoes. 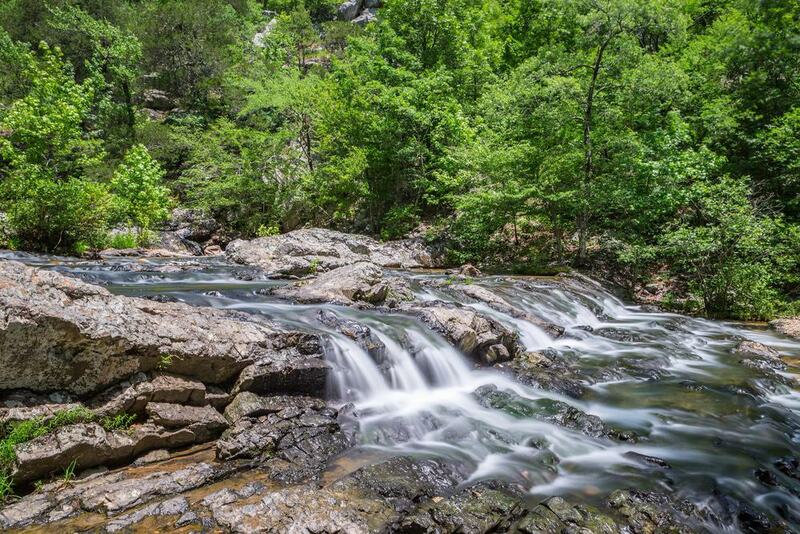 Located in the Ozark National Forest, about a half hour drive from Van Buren, Natural Dam’s appeal lies in its easy access, natural surroundings, and its massive breadth which spans nearly 200 feet across Mountain Fork Creek. If unfastening that seatbelt and opening the car door is more effort than you’re willing to exert, fear not, because the beautiful falls are just a few yards away from the road. Depending on the water flow and the time of year, fishing and swimming are popular, and the park has picnic tables too. Located in the Richland Creek portion of the Ozark National Forest, Falling Water Falls is considered by many who’ve seen them to be the most beautiful in the state. The area’s fascinating geology is comprised of interesting, stratified rock formations, boulders, and encroaching forests. Below the falls is a cool and swimmable pool, and it’s even possible to get behind the flowing water for a unique experience. The falls are viewable from the road if that’s more your style. They’re beautiful year-round, and in the winter during times of low temperature and water flow, large icicles often hang from the fall’s precipice. Located in the Ouachita National Forest southwest of Little Rock, Little Missouri Falls are cascading falls that happen to be near one of the park’s premier camping areas too. 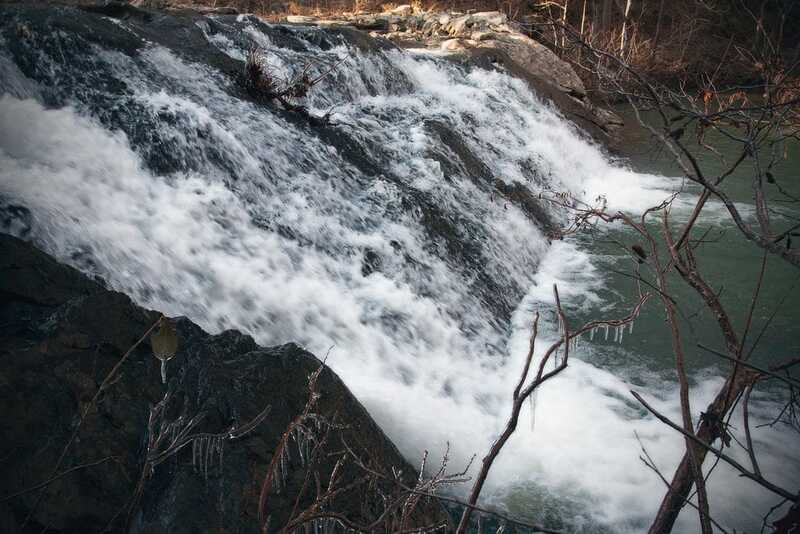 The falls are reachable on foot from the Albert Pike Camping area, but there are some slick and treacherous spots. Even so, it shouldn’t take more than 20 minutes. If that sounds like too much work, there are other trails that lead to similarly beautiful vista points from which you’ll be able to see the area’s splendor. The park offers lots of other great activities, including canoeing, fishing and swimming, which you can do in the Little Missouri River, or nearby Shady Lake. Also located in the Ozark National Forest, Haw Creek Falls aren’t in the running for world’s highest falls, but they’re tucked into a remote portion of the park, and are close enough to be seen and heard from a nearby campsite. 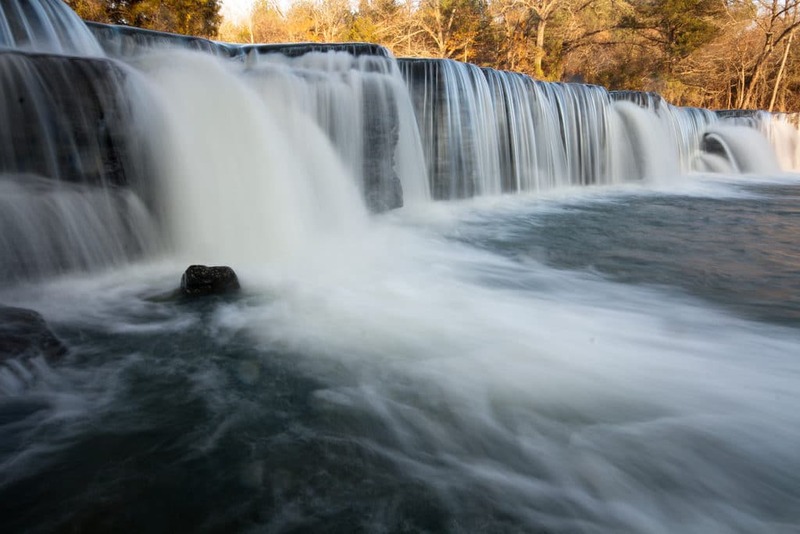 The recreation area is near the town of Pelsor, Arkansas, and is home to a few other falls too, which are an easy walk from the camping area. Haw Creek is remote, scenic, and surrounded by lush, green forests that hang over the water’s edge, and is a great place to swim and fish in the summer. Located in Buffalo National River Park southwest of Harrison, and near the town of Jasper, 37-foot Eden Falls are on the Upper Buffalo River in north-central Arkansas. Like lots of Arkansas’ waterfalls, there’s a cavern behind the cascading water that’s a fun and eerie place in which to crawl around. The area is noted for its birds, flowers and tranquility, and since the falls are easy to get to, you won’t have an excuse to stay in the car. The slick, mossy rocks and encroaching forests around the falls give the area a primordial feel. As you may have guessed, Mirror Lake Falls are in part famous for the reflections on their still waters that often resemble a painting. The lake was created in the ‘30s as a CCC project, which aimed at building important infrastructure and putting America’s largely idle workforce back to work. The waters are rich in game fish, especially trout, and below the falls there’s a large cavern created by overhanging rock that’s a really cool place to explore. The falls have multiple terraces, and can be viewed from a circular trail that is less than two miles long. 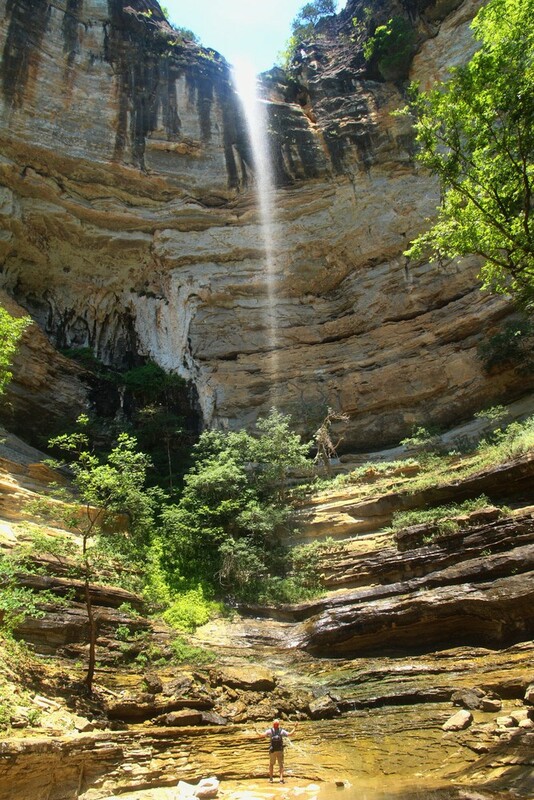 Fed by a spring that seeps through the rocks above the falls, Glory Hole Falls is one of the most popular in the Ozark Mountains. There’s also a large grotto below and behind the falls, and the area is a favorite with spelunkers who come to explore the labyrinth of caves that have been carved out of the rock over the years. 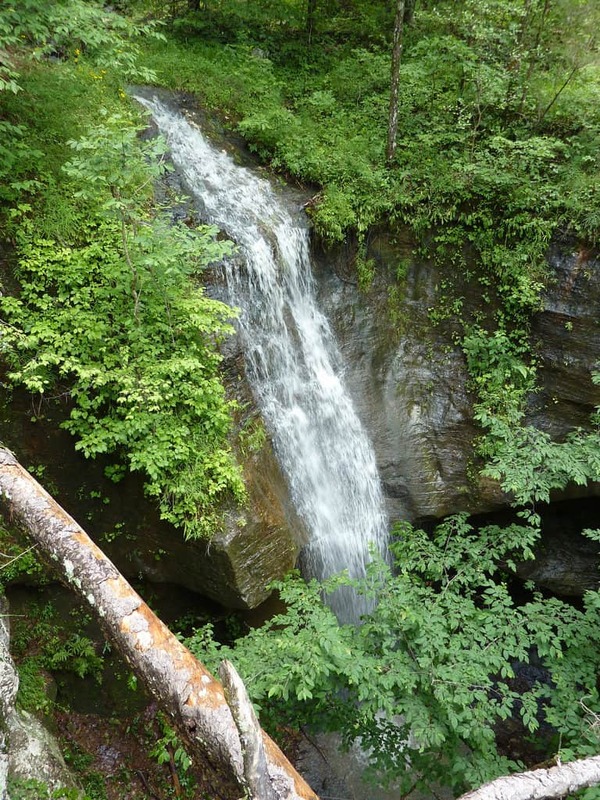 The falls are near the town of Fallsville, and can be reached by the Glory Hole Falls Trail, which is about a 2-mile round trip, and only moderately difficult. The area has many amazing geological formations that you won’t see elsewhere. 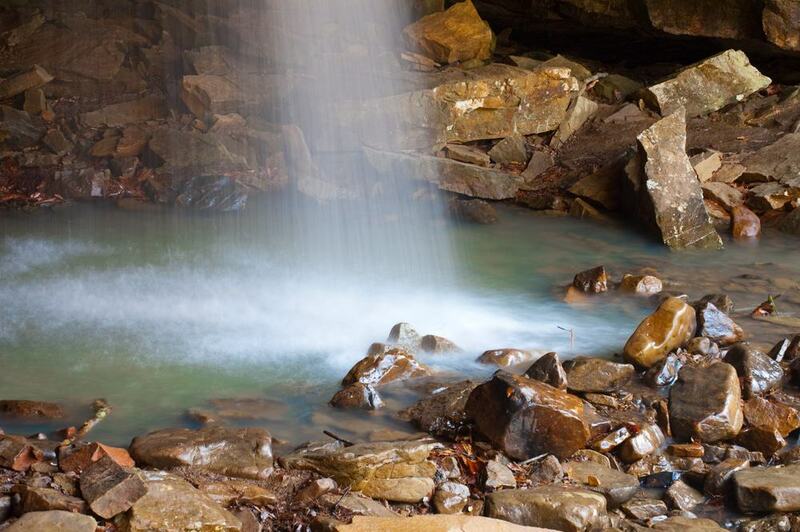 Another of the Ozark National Forest’s falls that should be on your radar are Hamilton Falls. The falls are among the most difficult to reach in the state though, as they’re in a remote area of the park that’s only accessible by a strenuous hike that’ll take up to 4 hours, depending on the conditions and your physical ability. The falls are less than 15 feet tall, but their charm lies in their remoteness, and the perfect serenity you’ll find in the surrounding forest. The massive boulders around the pool at the fall’s base are great places to catch few rays, or just relax and munch a granola bar. Located in the Ouachita National Forest that straddles the states of Oklahoma and Arkansas, Forked Mountain Falls are in the section of the park at the highest elevation. The falls themselves are relatively small, but their quaintness and the splendor of the surrounding park and 1,400-foot mountain on which you’re standing will leave you feeling content. The trail leading to the falls is near a popular campground and leads to the base of the falls. The trail is pretty easy, and once you’ve had your fill, keep going and you’ll come to another waterfall.